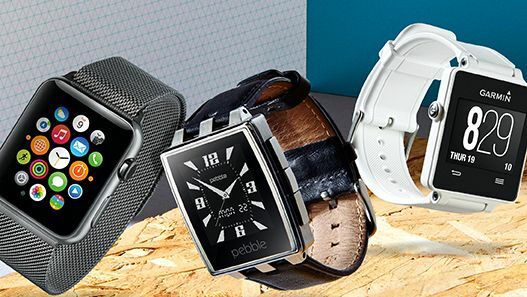 Are smartwatches just a fad? It's a question we've been hearing a lot lately, but the answer is: no chance. Most people thought exactly the same way about tablets just a few years ago, and we bet they couldn't imagine life without their iPad or Samsung Galaxy Tab now. There's always a certain amount of apprehension when it comes to new technology, and especially when not a lot is known about it (the publicity surrounding smartwatches has been fairly low-key until recent months). But make no mistake, wearable tech is about to hit its stride. Apple, Pebble, Google and even Mirosoft are desperately vying for your watch cash, and this will see millions pumped into making the things and supporting software makers. Give it 12 months and T3 rekons that, instead of giving you a funny look for wearing a smartwatch, people will think your wrist looks bare without one. Oh, and don't forget to check out our guides to the best smartwatch and best running watch. If you want to play it safe and side with one of the big platforms, there are three kinds of watch to pick between: an Apple Watch, an Android Wear watch or a Pebble. Despite being the newest kid on the block, the Apple Watch is the one everyone from gadget nerds to daytime-TV-watching nans has heard of. Apple has embraced the luxury side of watch making, with models starting at £299 for an aluminium-face Watch with a rubber strap, and rocketing to £13,500 for an 18-carat gold Edition. Watch faces come in two sizes, depending if you want a butch or a more dainty look, and, this being an Apple product, there are loads of straps you can choose from, too: a variety of colours and a choice between leather, steel and rubber. You may be following the crowd by investing in an Apple Watch but at least you can do so with a degree of individuality. Just as Android phones are the iPhone's nemeses, so Android Wear sits at the other side of the smartwatch ring from the Apple Watch. And as with Android phones, these watches are made by a host of companies, including LG, Samsung, Motorola and Sony. Where Samsung dominates the Android phone world, though, T3 thinks you should consider a few other Wear watch brands first. Two of the top contenders are the LG G Watch R (or its pricier twin, the LG Watch Urbane) and the Motorola Moto 360. T3 knows you want a watch that doesn't look like a reject from the Toys section of the Argos catalogue, and both of these fit the bill. The G Watch R is the spit of a 'normal' watch (and the Urbane is – while a little OTT – extremely smart), while the Moto 360 is the futuristic-looking smartwatch of our daydreams. Top Android Wear watches cost around £200, which is about £100 less than the entry-level Apple Watch. Not bad, right? One of T3's favourite series of smartwatches was also one of the first to become available. Pebble is a watch company that takes a totally different approach to that of the big corporate kings. The indie picker's choice, it funds its smartwatches through Kickstarter, although they're now so popular you'll find them on the high street. Thanks to the e-ink smartscreen tech used in Pebble watches, the Pebble Steel lasts for up to a week off a full charge; a bit better than the single day offered by the Apple Watch. You may want to wait for Pebble's first colour smartwatches, though: the plastic Pebble Time and the Pebble Time Steel. T3 is every bit as excited about these as it is the Apple Watch. The Steel edition will last for up to ten days on a single charge, is waterproof and will do 90 per cent of the things you can do with an Android Wear or Apple Watch. Another option is the Alcatel OneTouch Watch. It looks great, costs about £80 less than its Android rivals and lasts for up to five days off a charge (although, to avoid disappointment, we recommend you expect three days). It's not as slick as an Android Wear watch, but it does have a heart-rate sensor and, with the saving you make, you could go out and buy yourself a snazzy new phone. The one that should really lure a few of you away from the biggest brands, though, is the Garmin Vivoactive. Prepare for your jaw to drop: the battery lasts for up to three weeks, it has an always-on colour screen and it boasts fitness tracking as good as a running watch, thanks to on-board GPS and smart multi-activity software. It doesn't have the apps of Android Wear watches or the cool UI of an Apple Watch, but it does have bona fide smartwatch features and is the perfect choice if you care more about running or cycling than reading emails on your wrist. If all that sounds a bit too techy, don't fret: there's one company making smartwatches that look and feel exactly like normal ones. Check out the Withings Activité and Activité Pop. There's no screen and no nerdy LEDs, just a little step-tracking dial to the right of the clock face. The rest of your info (including sleep-tracking stats) is picked apart in the accompanying phone app. Withings' watches are laid-back, though: you won't be able to read phone notifications on these wearables. So, there are all kinds of things to separate watches, but there are lots that they share, too. For a start, virtually every smartwatch is designed to team up with your phone over Bluetooth (although some wearables are more flexible in terms of compatibility than others – read on to find out more). Each watch will have its own phone app that interfaces with it for better functionality. And in all cases, it's probably better to browse for extra apps on your phone rather than on the watch itself. Trying to do anything too involved on a one-inch screen can get a bit fiddly. Battery life is certainly an important consideration when buying a smartwatch (how did you know we were going to say that?). Use an Android Wear or Apple Watch a fair bit and you can drain down the battery in a day. Having to charge your phone every day is one thing, but your watch too? One advantage that the Android Wear and Apple wearables have over, say, the Pebble Time is that they use gestures to activate them (ie the Apple Watch will come to life with a gentle flick of your wrist), which enables them to sleep for 95 per cent of the time, thus saving precious battery. But then again, having to tap or waggle to tell the time isn't for everyone. It's no great surprise that the Apple Watch needs an iPhone to do virtually anything, but it's not the only one to be so inflexible.Android Wear watches need an Android phone to pair with, although it's predicted that they'll work with iOS one day. And one of the pickiest smartwatches is the custom-OS Samsung Gear S. It does a lot on its own but only pairs with Galaxy phones. Pebble watches work with both Android phones and iPhones, as do some of the other, smaller players, which have deliberately gone off piste to try to do something a bit different. So, what can you actually do with the things? For a start, you can do the obvious stuff: they're still watches at the end of the day, so they'll tell you the time, the date and the weather. Most will also snag notifications from your phone to enable you to check out your emails, texts, Whatsapps and call alerts without freeing your mobile from your pocket. An array of sensors will count your steps, while some go to the next level with GPS and a heart-rate sensor. This makes them perfect for the gym, especially as many enable you to control your music from your wrist, too. Smartwatches are totally customisable. Android Wear and Apple Watches especially have reams of available watch faces, enabling you to choose between analogue or digital, info-packed or sparse displays, and so on. The Apple Watch even has an official Mickey Mouse face. Katy Perry likes it, apparently. Android Wear and Apple Watches also come with extras you don't get with some of the simpler wearables. For instance, you can quickly reply to your friends' messages with emoticons, and the Apple Watch even enables you to send your heart rate to someone. It's a slushy thing, not to let them know you're having a heart attack. A number of games have already been developed for smartwatches (for an example, see 'Making the Most of Your Wearable' on p82). Sleep trackers, phone finders and Sonos controllers are also available. And as our homes become smarter, so our wearables will be used to talk to everything in the house. Just imagine it: when your smartwatch senses you're in a light-sleep pattern, it sets off a wake-up lamp. As you come to, you feel like you're on the right side of the bed for once. A couple of swipes gets the coffee machine going downstairs, and your watch already has today's to-do list ready to flick through over a bowl of cereal. A couple of taps later, your breakfast tunes are rolling and you've checked the train times. Ready for work? Just leave. A location-aware macro will let your appliances know you've left the building. It all sounds exciting, doesn't it? And all of that is just in the first hour of being awake. The smartwatch revolution is yet to fully explode but, when it does, your life is going to change at the flick of a wrist. You can dodge security, flirt and plan your journey from your wrist. Dislock bypasses an Android phone's lock screen when it's paired with your Pebble watch. Out of range? It goes back to using normal security. It may sound simple but it'll change your life. Have a few minutes to wait until your bus arrives? Give your ego a workout with a bit of wrist Tinder. It works just like the phone app, enabling you to reject potential suitors or give them a virtual wink. Take public transport in London? Then you need this. With Android Wear, it'll notify you when Tube lines go down, while with the Apple Watch you can plan journeys and see when your bus is due. Step one is to make sure that Bluetooth is switched on in your smartphone. No matter what mobile you have, this will be in Settings. You then need to pair your phone and watch. This should be part of the prompt when you first turn on the watch. To get the most from your smartwatch, your phone should have the relevant app installed. If you have Android Wear or an Apple Watch, the one you need is obvious as it nabs the name of the platform. If not, search for your watch's name in your apps store. It's now time to customise, if you want to. The first thing you might want to fiddle with is the watch face, as it's probably your wearable's best stab at a distinct personality. You can alter this either in the Settings menu of the watch or via your phone's watch app. Now it's time to prune back the notifications. No one wants to be buzzed 50 times an hour, so make sure Candy Crush Saga isn't going to be firing bits of digital fluff at you all the time. You'll most likely find these notification options in the phone's companion app. Like this? Don't forget to check out our guides to the best smartwatch and best running watch.